Te Alai Darwaza is amongst the most perfect specimens of the architecture of the Delhi Sultanate especially of the Khilji dynasty. Built in 1311 AD, it was part of Ala-ud-din Khilji's extension plan of the Quwaat-ul-Islam mosque on the northern, eastern and western sections. Alai Darwaza was one of the four grand gateways; the other three could not be completed because of Ala-ud-din's death. Alai Darwaza gives an idea of the grandiose Khilji plans; "nothing so ornate was done by them afterwards", wrote the historian Fergusson. The Alai Darwaza was completed in the first year of extension works at the Qutub mosque. The main structure consists of a single hall 34.5 feet inside and 56.5 feet outside. The domed ceiling rises to the height of 47 feet. The three doorways on the east, west and south are lofty pointed arches of the horseshoe type, which rise above the flanking side bays. The horse- shoe shaped arches were used for the first time in the Alai Darwaza. The northern entrance has more indigenous character since its arch is semi-circular. The proportions of the Alai Darwaza are extremely pleasing while the recessed corner arches of attractive 'horse shoe' form carrying a plain spherical dome over the square chamber are an especially happy solution of this universal constructional difficulty. 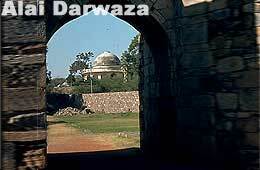 The Alai Darwaza is the first true dome constructed in India. Earlier the attempts to make domes were not successful particularly the tomb of Iltutmish. The dome of the Alai Darwaza is a noteworthy achievement. The dome was constructed on highly scientific principles and has withstood ravages of time for more than six hundred and fifty years. A series of squinches of pointed shape, one recessed within the other, in the upper section of each angle of the hall, changes the square into an octagon and next the octagon into the circle of the dome with an interweaving sixteen-sided shaft formed by a bracket at each end of the octagon. Through fastidious application of geometrical principles, the load of the dome has been gracefully conveyed to the ground, from the circle to the sixteen-sided shaft, from the latter to the octagon and then to the four walls of the square chamber. The pointed shape of the squinches matches well the shape of the entrance arches. The plinth on each side is beautifully carved with floral and geometrical carved with floral and geometrical designs in both white marble and red sandstone, creating a superb polychrome effect. A single storeyied structure, it gives an impression of being double-storied from outside. The perforated, latticework window screens are set in the recessed windows on both sides of the entrances. These marble screens set off the monotony of vertical lines of calligraphic ornamentation. The most charming aspect of surface decoration is the lace-like interweaving of floral tendrils, repeated with a flawless symmetry on all the three entrances, elegantly designed and perfectly built. The northern entrance is semi-circular trefoil in its outline. The fa�ade is elaborately ornamented in sensuous carving and patterns, so characteristic of the pre-Turkish days: the indigenous workman has been allowed to dictate. Indigenous artists and craftsmen made earlier structures but the Alai Darwaza shows the influence of the Seljukian art. The Seljuks had started fleeing Western Asia after Mongol invasions in the 12th century AD and had reached Delhi. The 'spear-head' embellishment on the three entrances is of particular importance in this regard. Also the surface ornamentation has been done with an eye for lavishness and detail. The Alai Darwaza stands isolated at the southern end of the Qutub complex. For a fuller view you have to go to the garden end near the boundary wall. With the Qutub Minar behind it, the Alai Darwaza appears a fitting part of the grand structures of the Sultanates. Ala-ud-din Khilji also extended the Quwwut-ul-Islam mosque to double the size of the mosque made by Qutub-ud-din Aibak. He also made the madrasa on the western side of the mosque for children to get education in Islamic studies. Ala-ud-din also planned to build a minar double in size of the Qutub Minar. He had started the work but was not able to complete it because of his death. Alai Minar can be seen in the Qutub complex, whose diameter of the base is much larger than that of Qutub Minar. One can imagine by just looking at it that how tall the building would have been had it been completed. 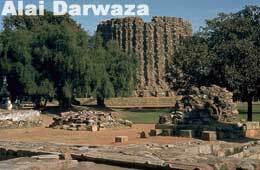 Alai Darwaza along with other structures of the Qutub complex are included in the list of UNESCO World Heritage Site.